The great paywall debate: Will The New York Times’ new model work? Editor’s Note: We’re wrapping up 2010 by asking some of the smartest people in journalism what the new year will bring. Many of their predictions centered on what may be the most anticipated business-model shift of 2011: The New York Times’ shift to charging for full access to NYTimes.com next month. We found voices on both sides of the “will it work” debate. Here are Markos Moulitsas, Megan McCarthy, C.W. Anderson, Paddy Hirsch, Jason Fry, Nikki Usher, and Barry Sussman on how they see the metered model shaking out. Prediction for 2011: The building up — and subsequent tearing down — of online paywalls for general news sites. The New York Times are planning to implement their paywall in January and I predict it will be modified enough — either by the Times themselves or outside developers — to be rendered irrelevant by March. Faced with a massive migration of regular readers to the Guardian and the BBC, The New York Times will abandon its recently enacted paywall. 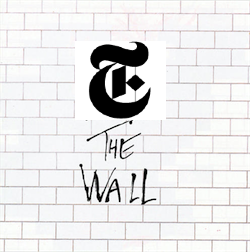 Now, since The New York Times “porous” paywall won’t even go into effect until early 2011, it’s possible the so-called “wall” will still be active as 2011 draws to a close. But the decision to ditch it will have already been made internally. The wall won’t affect many readers, but it will impact the obsessive news junkies, the people who want to trawl every WikiLeaks cable and parse every detail about the inner workings of the U.S. State Department. Where will these folks go? Will they pay up? Of course not — they’ll simply click over to the Guardian and the BBC, two websites that fit nicely into the demographic niche currently occupied by the Times. Links to the Times will dry up (despite the paywall’s porousness). The egos at 620 Eighth Avenue wont be able to handle the shift in the center of the news conversation across the ocean, and there will be more and more exemptions made to the types of online content that counts towards the meter. Columns will be first to go. The paywall won’t ever make or lose much money, but the real impact will be cultural and organizational — suddenly the Times won’t be the most important news institution in the minds of the American public. Finally, the whole thing will be quietly shelved. Secondary prediction: The paywall won’t ever be launched, and the leaders of New York Times Co. will admit it was all hatched out in a moment of online madness that swept the industry in late 2009. The New York Times’ switch to some sort of online pay-to-read system will be a financial success right off the bat — even a windfall for the Times. While news outlets that are hewing to the pay-to-read model will persist in charging readers, the trend will continue to move against them. More and more content will be offered for “free” to consumers as distribution platforms continue to proliferate. Inevitably, this will erode the pay-model outlets’ readerships, and we’ll eventually start to see capitulation by all except the most “niche” journalism organizations, such as trade magazines. Paywalls will succeed — to a point. The Times and other papers will have success with payment plans that hew to the metered model practiced by the Financial Times, Journalism Online [which owns Press+], and others. But this success will be limited: It will be effective in getting papers’ most loyal customers to pay, but that percentage of customers will be so small that such efforts will be largely seen as failures. We’ll still be talking about analog dollars and digital dimes and bemoaning the lack of a silver bullet. The subscription debate will have moved away from absolutist dogma to a more nuanced view, which will be good, but the level of frustration will remain high and contribute to a lot of noise in conversations. The NY Times effort to implement a paywall won’t survive the end of the year. Beckett, Lois. "The great paywall debate: Will The New York Times’ new model work?." Nieman Journalism Lab. Nieman Foundation for Journalism at Harvard, 13 Dec. 2010. Web. 20 Apr. 2019. Beckett, Lois. "The great paywall debate: Will The New York Times’ new model work?." Nieman Journalism Lab. Last modified December 13, 2010. Accessed April 20, 2019. https://www.niemanlab.org/2010/12/the-great-paywall-debate-will-the-new-york-times-new-model-work/. | title = The great paywall debate: Will The New York Times’ new model work?